Sambar is a delicious curry made with lentils and vegetables. It is very popular in south India and is made in most South Indian homes. Sambar can be served with idlis, dosas, rice, upma, pongal, vadai, etc. I have already shared recipes of making sambar like masoor dal sambar, toor dal sambar, etc in my earlier posts and today, I am going to share an easy recipe of making Saravana bhavan style sambar. Saravana bhavan is a popular vegetarian hotel in Chennai. It has branches in other places as well. 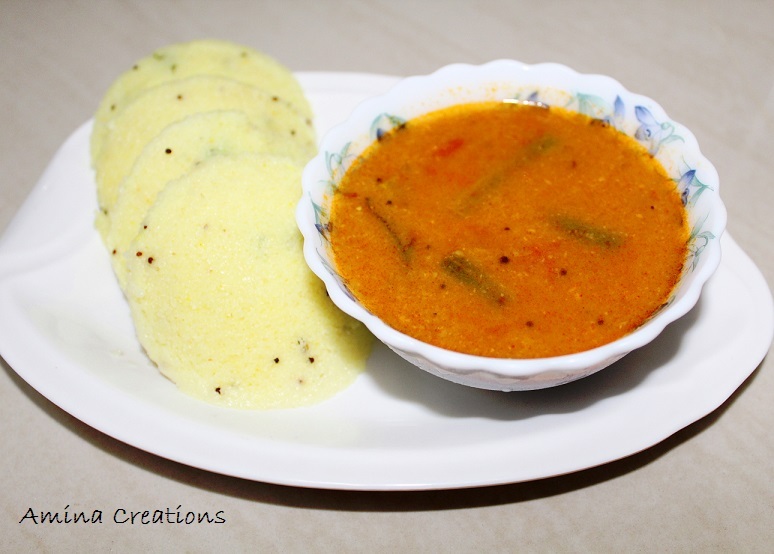 I am a great fan of saravana bhavan sambar, and so I decided to make Saravana bhavan style sambar at home. The main ingredients that make it different are roasted gram and coconut. 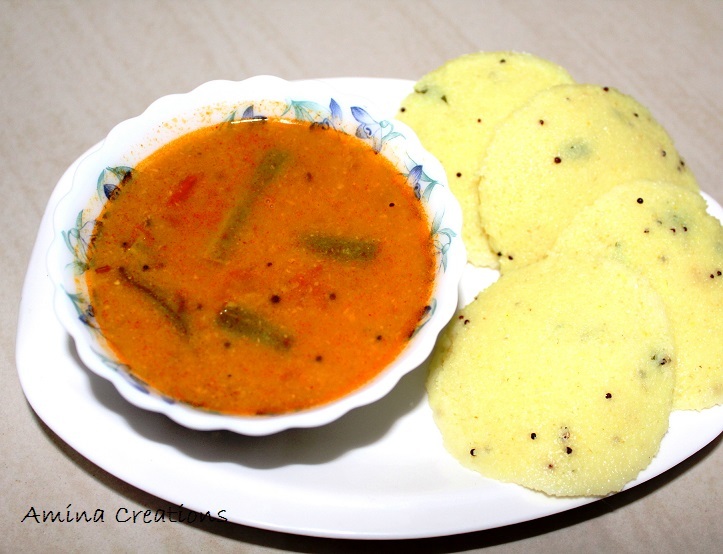 I served this sambar with rava idli (recipe coming soon) and it tasted simply fabulous. Do try out the recipe. I am sure you will like it. Drain the water from the toor dal and add the dal along with turmeric powder, red chilli powder, garlic cloves, tomato and 2 cups of water to a pressure cooker. Cook for about 6 whistles. Once the pressure subsides, open the lid and gently mash it. Boil the carrots and drumstick in a pan with water for about 10 minutes or till cooked. Grind the roasted gram and coconut with some water to a smooth paste. Add this paste along with tamarind pulp and salt to the dal. Add the cooked vegetables and water if necessary and bring to a boil. Meanwhile heat another pan with oil, add mustard seeds and cumin seeds and allow it to sputter. Next add the chopped tomato and sauté till it turns mushy. Now add sambar powder, asafetida and mix well. Add this tempering to the dal and mix well. Continue cooking for 2 to 3 minutes and then add 2 tbsp of ghee. Switch off the gas and transfer to serving bowl. Serve hot with idli, rava upma, pongal, dosai, pesarattu or even rice.